Oxley Highway looking towards the Junction of Newell and Oxley Highways, just east of Coonabarabran, looking south-west. The Newell Highway is a major road in New South Wales, Australia. It runs from the Queensland border to the Victoria border. It is new South Wales's longest highway. It is almost 1,000 kilometres (620 miles) long. It is the main road between Brisbane and Melbourne. 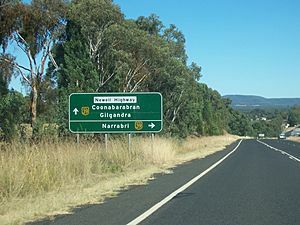 The Newell Highway runs through some large towns such as Moree, Dubbo, Parkes and Narranderra. National Route 39, the Newell Highway, in New South Wales, just south of West Wyalong, looking south. Newell Highway Facts for Kids. Kiddle Encyclopedia.